French duo Behzad & Amarou, residents of Concrete Paris, release the second track on their newly launched Bear imprint featuring four cuts from NYC producer Cory James. 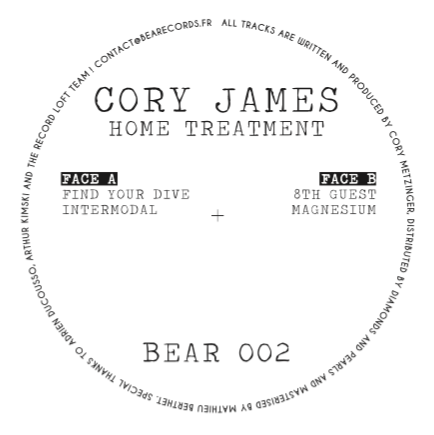 As established DJs in the French techno scene, Behzad & Amarou’s tastemaker talents has transferred into A&R prowess, evident in this release from New York’s Cory. Known for putting out music on his Dusk Notes imprint and releasing on L.A.G. as one half of Point Break, James also holds a monthly resident at Jordan’s Division Point Industries in Brooklyn. ‘Find Your Dive’ begins with raw, thudding kicks that make way for ethereal background pads followed by a lead. ‘Intermodal’ then follows a darker aesthetic, with echoing stabs and hissing atmospherics, before ‘8th Guest’ gets even more sinister with various spacey effects that add to a heightening tension. Concluding the package, ‘Magnesium’ is a growling production with reverbed percussion, resonating bass and chilling synths.